As the world bids farewell to the Queen of Soul, Aretha Franklin, the tributes are many from far and wide for the sensational person, artist and figure she was. Yet, for most that mourn and also celebrate her wonderful life, she will be remembered mostly in her many songs. What is so amazing is the number of songs that she covered that she brought a life and an interpretation to that went well beyond the original. Respect was written and first recorded by Otis Redding, with the man, the husband, pleading for respect when he gets home, Aretha Franklin took it and sang it from the perspective from the woman, the wife and the rest is history. Two Grammy awards and the induction of her version into Grammy Hall of Fame. There are many other songs that people have come out to sing in charted a literally 7-decade-long career. A difficult childhood, she had, parents divorcing when she was 6, her mother died of a heart attack just before she was 10, having 2 children at the ages of 12 and 14 respectively, she was a preacher’s daughter, but it did not save her from a cruel world out there. Her talent did, and it did greatly. However, the song that registers the most to me as delivered by Aretha Franklin was written by the Beatles, she again took it and rendered it in both a haunting and a somewhat uplift tempo, the words of the song, full of meaning that made you think. It isn’t Think. She wrote that with her then husband, Ted White. 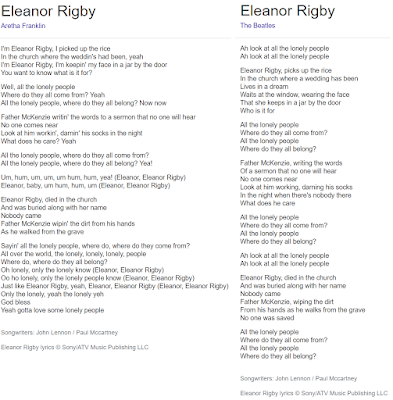 Eleanor Rigby was written in 1966, first by Paul McCartney and completed by the Beatles, but credited to Paul McCartney and John Lennon. Between the version written by the Beatles and the version that Aretha Franklin performed, she basically took a fictional person with a life story of a nobody, about whom nobody cared except for what needed to be done in burying her after she died. The Beatles – 1st verse. Aretha Franklin – 1st verse. The juxtapositioning of being unknown as a nobody and the reality of being a lonely person is a haunting and fearful thing to think about. Yet, there are many, unknown, unsung, unseen, unheard, untouched, unloved, and more that have a life and then a death that would speak like that of Eleanor Rigby. 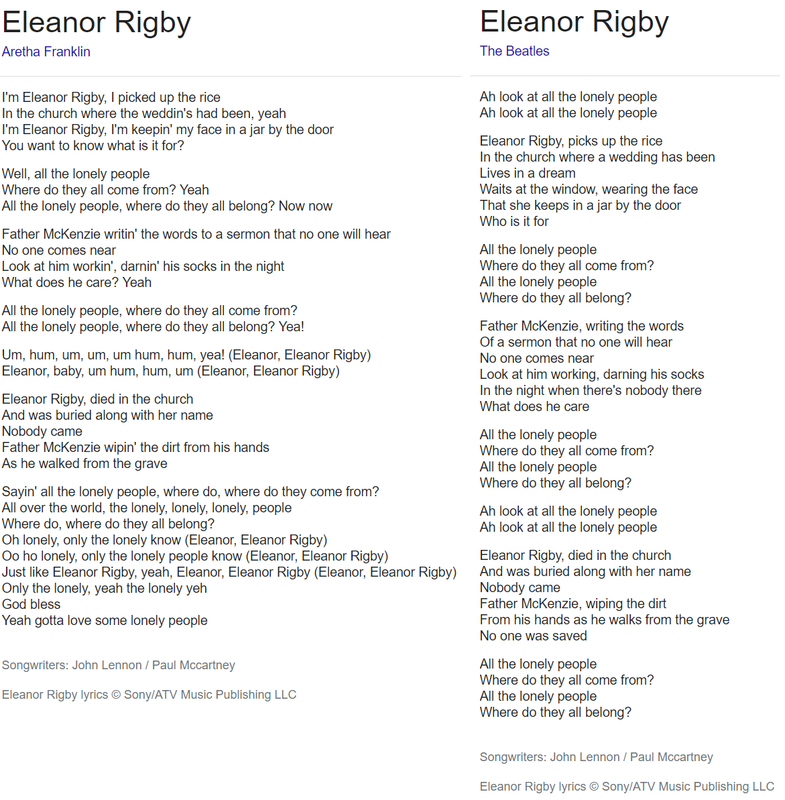 When Eleanor Rigby died, she died in the church, Father McKenzie whose frugal life is noted in darning his socks, having written an eulogy, a tribute to Eleanor Rigby, to the hearing nobody to the fact that in the Beatles version, nobody was saved by what may have been a moving tribute, but who can tell? Aretha Franklin takes the abstraction to the involved, creates a person and speaks in the voice of that person. This is deep empathy rather than plain sympathy. This is where Aretha Franklin made Eleanor Rigby somebody, a person, a story that began in the first person and then it became a story told to many. Eleanor Rigby took a place in our minds, the minds of many of us seemingly lonely people in many ways social, emotional and much else, with the promise that we would be left unsung. When I first heard Aretha Franklin’s version, I thought Eleanor Rigby was someone who lived at a certain time and after her death was recognised for something. I had not heard the Beatles version before that. Eleanor Rigby is almost a premonition, a niggling anxiety, yet, whatever happens when one is dead is really for the living to take care of, and that is a hope of sorts. God bless you, Aretha, you made more than a difference. Hair is politics, or should I say political. It is also commercial, it is big business. Yet, it is quite personal, the choice of expression with or without hair is interesting and sometimes just left to the observation. Then, you come to the real issue, the one of hair for black women. I was walking down the road on Boulevard de Strasbourg, just after the Saint Laurent Catholic Church on the left, before the street changes to Boulevard de Sebastopol and I observed something I had not seen before. There were men stood in front of shops accosting women and doing everything to persuade them to come into the shops, black women that is, and these shops had dangling from every window and hook as you peered in from the shop windows and the doors, hair of every dark shade, ready to be used as augmentation of natural hair. Now, I have seen architectural works of the hair that I cannot fathom how much skill and time it has taken to put those creations on the heads of the wearers and they do not come cheap by any stretch of the imagination. I have written of this section of Paris before, both sides of the street teeming like an African ghetto that even I feel too much of an outsider to be able to relate. Literally, every shop sells hair and cosmetics, and as they are all selling the same things, you do wonder about what makes each shop unique as competition is brisk, if not cutthroat, you probably need men to literally muscle in the customer off the street. The hair, however, is a different story, having travelled off the shorn heads of poor people from the hinterland of Brazil and India, the hair has become the travelled dream of people who probably would never see miles beyond their locality for a lifetime. The profits from these lengths of follicular fancy would hardly get to them. That is absorbed somewhere in the value chain by people who have probably become billionaires in the purveyance of this fleeting enhancement to beauty. I would not know if there is a fair-trade hair construct that ensures a bit more of the profits of this arbitrage goes back to the source communities of the hair. That is another element of the opacity of capitalism. I guess for me, the only hair product I use is a razor and shaving gel if that counts as hair products. I shave my head just while I shave my beard, or whatever those itchy bristles are. It was funny and cheeky when my friend as he was using the shower ventured then declined. He then said he could not ask me for something I basically could not have. Shampoo! That is another story. The trade in hair is about to get nasty and it is in the pulling of customers rather than of their hair.